If you’re a salon owner, you understand the importance of having good communication practices with your clientele. Between scheduling appointments, filling canceled time slots, keeping customers informed of new products and services, it can be a bit overwhelming if you don’t have a good communication plan in place. 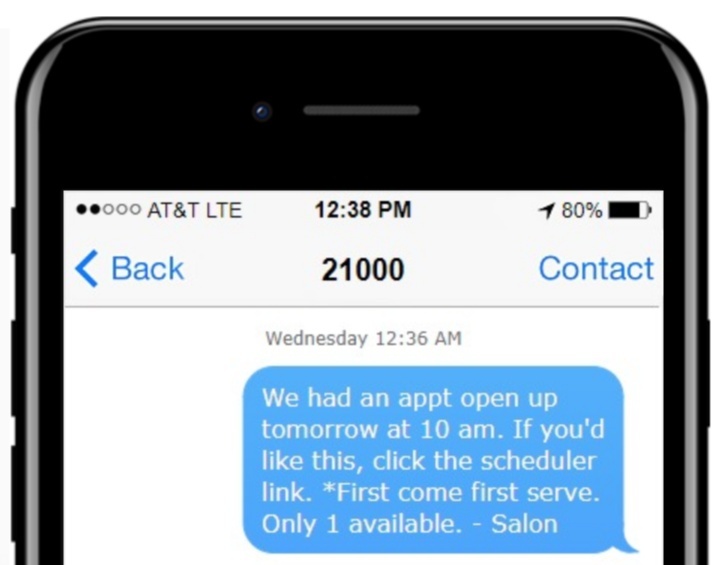 Integrating text message marketing and communication can drastically help salons increase business and save time in their communication efforts. We all understand that text message is a great way to communicate. It allows the message receiver to respond at a time that is convenient for them but still gets the message across. In fact, 98% of all text messages are read and 90% of those are read in 3-minutes or less. Utilize those results for your salon and get better results versus email or print efforts. Send Reminders: You can set reminders based on a customer’s last visit to remind them to schedule upkeep appointments. 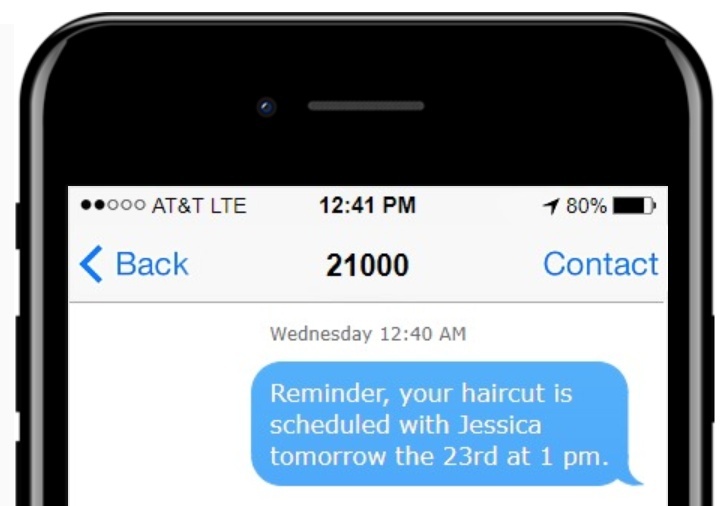 For example, you can set a reminder to come in for a haircut every 8 weeks based on the last time the customer had their haircut. You can also put a link in your text message to your online appointment scheduler so that it’s all automated and saves you time while keeping you busy with more client bookings. It is against regulation to just add your customer’s phone number to your text list without their permission. You can get permission from them from your regular cell phone, emails, in person, etc. A great way to start is just by asking each client as they are getting ready to leave if they’d like to receive appointment reminders and specials to their cellphone. If they say yes, you can give them the opt-in instructions. The opt-in is simply texting your chosen keyword to the five-digit number provided by us. For example, you would say text SALON to 21000 and when the client completes that step, they will automatically be added to your text group. Another great way to gather opt-ins is to put the instructions on all of your printed materials like the back of your business card, postcards, you can print something to place on your stations, social media, email/newsletters, the more places to get your instructions out there, the better your results will be. A great way to get people to join your text list from printed materials or social media is to offer a special. For example, you could say “Join my text club and receive a 10% off your next visit.” This gives people an incentive to join and once they are in your group, you’ll be able to continue to market to them and get them to come in more frequently for services. *Tip, you can add an expiration date on all of your text message coupon offers. Start by signing up for a 15-day free trial here. The trial includes 100 messages and a great opportunity for you to test the system with no credit card or commitment required. Upon signup, you’ll be asked to chose your Keyword. This is the word that your clients will text into the number to join your list. You can choose your salon’s name or whatever you think will suit your business best. *Tip, try to choose a word that doesn’t try to auto-correct or is hard for people to spell. Log in to the dashboard here. Once logged in, set up your auto-response message. This is the message that our system will automatically text a client when they text in to join. You can change your auto-response as much as you’d like. As with any marketing, you don’t want your messages to be annoying. Send messages that are timely and have real value. Most people will appreciate an appointment reminder, discount offer for a service they use, or an occasional message about a new product or service. There are many text messaging uses but be sensitive to the number of messages you are sending in a month and also the time of day that you are sending the text message. Anyone who is part of your text group can opt-out at any time by replying STOP to the message which is great because it is automated and you won’t have to deal with removing people if they have moved or no longer want to receive the text messages. If you aren’t experienced with texting software there’s no need to worry, it sounds more complicated than it really is. We also offer complimentary Customer Success Managers who are assigned to your account that can help you configure your account, set up scheduled messages, and help you get more opt-ins. We’ve mentioned a few of these throughout this article but here is a list of ways salons can use our text message system to save time and generate more revenue. Message Scheduler: Schedule out marketing messages months (or as long as you’d like) into the future. Schedule holiday specials, updates on holiday hours, and more. Drip Campaigns: Drip campaigns are great for salons! A drip message is a pre-determined (by you) set of messages that will go out to a text group opt-in based on the day they opted in. For example, as a salon, you could set the first drip message, to go out 6 weeks after someone joins your list that says, “Schedule any service and receive a free sample set of our new XYZ product.” Then the next message could be scheduled another 6-8 weeks after that. You’ll want to set the drip messages to be at the increments in time that someone should be inclined to return to your salon for follow up visits. 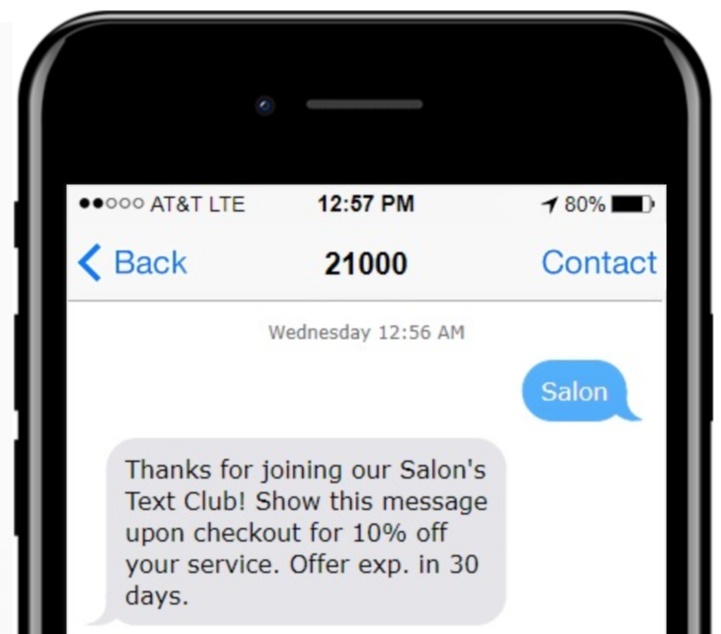 Text to Win: Use our built-in text to win software as another way to incentivize people to join your salon’s text club. 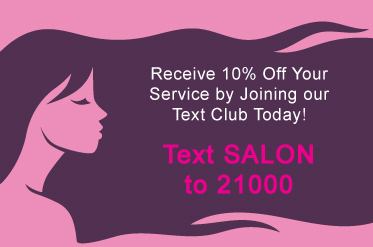 Example, Join Our Text Club for a Chance to Win a FREE Haircut & Style! When you set up your text to win, our system will automatically text out the winning text at the date and time your specified to the number of specified winners. Create a Poll: You can create a poll to find out any information you’d like to gather from your customers. Example, ask what additional service your current clients would like to see you offer. 1- Nails 2- Brazilian Blowout 3- Eyebrow Threading. By doing this, you’ll be able to generate more revenue per existing customer by providing them with other services they are wanting. We have more great features that work great for salons. You can view the full list of features here. As you can see, there are many great ways for salons to utilize text message marketing to generate more revenue, connect with clients, and save time. If you have any questions on how to make this work for your salon, feel free to reach out to our team and we’ll be happy to help.